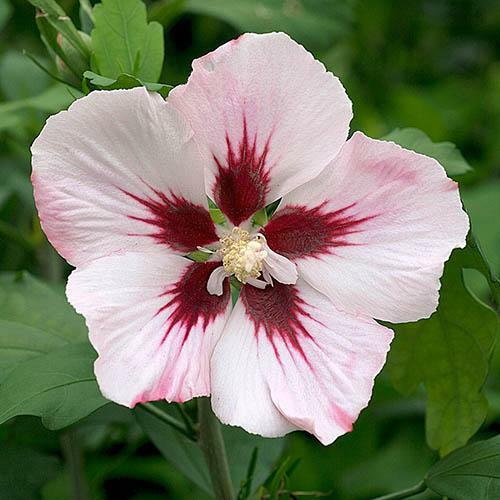 Create a fabulous exotic look, in your garden or on your patio, with our glorious hardy Hibiscus 'Hamabo'. Add a touch of the exotic to your garden with this fully hardy, award-winning Hibiscus shrub. Easy to grow, the abundant, blousy flowers will fill your borders or pots with vibrant colour all summer long. Also happy in a large pot where it'll bring a lush, tropical feel to your patio or decking. Wildlife friendly, the pink flowers will attract butterflies and other valuable wildlife into your garden. Supplied as an established plant in a 2L pot, 'Hamabo' stays compact, reaching an approximate height of 1m x 1m after 10 years. Also known as the tree Hollyhock or the Rose Mallow, Hibiscus syriacus 'Hamabo' is covered in large, bright pink blooms from July - not stopping until all buds have opened, sometimes right into autumn. 'Hamabo' is a medium-sized, award-winning deciduous shrub with strongly lobed, dark green leaves and blush-pink flowers up to 12cm (5in) in width, each with a bright red blotch at the base of every petal. The flowers shimmer faintly with iridescence in the sun, making this a garden plant that everyone will comment on. Despite its exotic looks, Hamabo is very tough, winter hardy and easy to care for, and is best placed in a prominent position, where it will bring a colourful display when other plants are beginning to look tired. Supplied as an established plant in a 2L pot, 'Hamabo' stays compact, reaching an approximate height of 1m x 1m after 10 years. Note - supplied dormant with no leaves Oct-April. Grow Hibiscus Hamabo in a warm, sunny spot for the longest lasting and biggest displays - it can be a hungry feeder, so give it plenty of feed through the growing season. Grow in a moist but well-drained soil in a sheltered position in full sun. Dig a planting hole 3 x wider than the roots of the shrub you're planting and mix some well-rotted compost or manure with the soil from the hole and use this to re-fill one the shrub is in place. Firm in the soil with your heel, avoiding the root ball and water well. Water regularly and keep the area free of weeds. Hibiscus can be bare of leaves right up until May, so keep it well-watered and it will burst into life when ready! Prune back two or three buds in the late winter months or early spring to encourage larger flowers the following summer - if the shrub is left unpruned, it will continue to produce numerous blooms, but they will often be smaller in diameter. Hibiscus flower on the current season's growth, so pruning encourages them to flower prolifically. Trim any dead or damaged growth each year in early spring.